NMIMS has released the list of shorlisted candidates for its GD & PI rounds for admission in 2019-21 PGP Batch. The registration window to open from January 23 to 28, 2019. Click here to register for the GD & PI rounds. NMIMS Admission Criteria- As per the latest notification released by the NMIMS, the institute has released the list of shortlisted candidates for the Group Discussion (GD) and Personal Interview (PI) rounds. The list was published on its official website-nmims.edu on January 22, 2019. Students can visit the official website to check their admission status by entering their registration number and password. It is to be noted only those students who applied for admission into NMIMS until November 4, 2019, will be able to check their admission status. The selected candidates, in order to participate in the GD & PI rounds, will have to register for the same. The registration window will open from January 23, onwards and the last to register is January 28, 2019. Candidates are advised to register for the selection rounds before the due date in order to avoid any last minute hassle. It is to be noted the registration window will be available for 6 days only and no registration will be accpeted post January 28, 2019. As per the NMIMS Admission Criteria, the GDPI rounds will commence from February 1 to 20, 2019. The final list of selected candidates will be released by February 25, 2019. Candidates are advised to check this page for regular updates on the NMIMS admission criteria and any update pertaining to the NMIMS Admission 2019-21. Narsee Monjee Institute of Management Studies (NMIMS) is a private owned deemed university that was established (as per UGC Norms in 1981 in Mumbai. It is one of the top, private Universities in the country which is renowned for conducting popular MBA course at 5 campuses in various cities of India. With an intake of over 12000 students and over 513 full time faculty members, the university is highly sought-after by the aspirants to purse management education. MBA at NMIMS is a two-year full time programme, spread over six trimesters. The pedagogy of the course includes summer internship programme which is conducted between the 1st and the 2nd year. MBA programme also promotes exchange covers faculty members as well as students from these places. The university has links with University of EUROMED Marseille in France, ESC ROUEN in France and with ESSCA at both its campuses, i.e. Angers in France and Budapest in Hungary for conducting the exchange programme in smooth manner. Another two-years, full time MBA course run by NMIMS that aims to enrich the students’ knowledge and KSA to help them join pharmaceuticals industry smoothly. The programme was commenced 6 years back with one foreign-language like Mandarin and/ or Chinese which is mandatory for every candidate. At the end of the course, an annual award ceremony is held where the sponsor company’s senior management hands over 16 awards to the deserving achievers (students) every year. It is a full time two years course in which critical skills; knowledge is focused upon in the domain of HR specialisation. The course covers summer internship for 8-10 weeks in which students undergo full time intensive training with industry under the guidance of a project guide and a faculty guide. The key foundation of the course curriculum is inclusion of experiential exercises, case studies, lectures from academicians and practitioners, group activity, workshops and presentations to enable knowledge dissemination among the candidates. Full Time Bachelor’s Degree (10+2+3) in Pharmacy, Science, Life Sciences, Medical Doctors MBBS, BDS, BE/B.Tech. (Bio-Tech/Bio-Medical), BHMS, BAMS, B.Sc and M.Sc in Biotechnology from a UGC recognized University with minimum 50% marks in aggregate in the first attempt. NMIMS deemed university generally follows a four step admission process for granting admission to the candidates in the MBA programme. As a first step, aspirants need to register for the NMAT by GMAC exam followed by paying the application fee to confirm the registration process. Thereafter, aspirants have to score the percentile as expected in the admission cut-off released by NMIMS campuses. Those candidates who score percentile as per the expectation are called for the CD/PI round. As a last step, a final merit list of shortlisted candidates is prepared and shared for final admission to the MBA course. Step 1: Interested candidates need to register and apply for NMAT by GMAC 2018 by October 3, 2018 and choose the preferred course and campus in which they wish to apply by paying an application fee of Rs.1300/- through Debit/Credit Card or Net Banking. 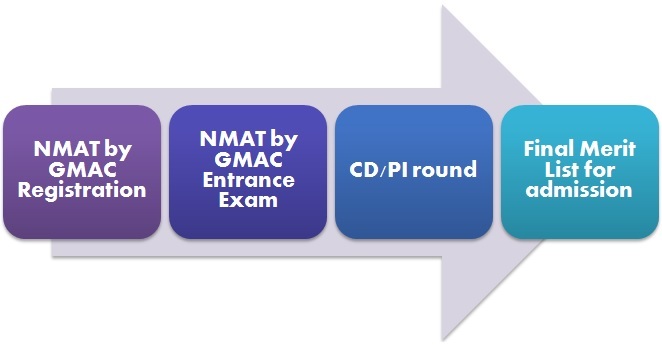 Step 2: Candidates have to appear for the NMAT by GMAC test. Step 4: A final Merit list will be prepared and released by the exam conducting body on February 25, 2019. Final call for admission will be made to those students who will make it to the final merit list prepared by NMIMS. Unlike IIMs where the aspirants are shortlisted on the basis of various parameters such as MBA entrance exam score, academic diversity, work experience, NMIMS shortlists candidates purely on the basis of NMAT by GMAC 2018 exam score for the Case Discussion (CD) and Personal Interview (PI) round. Those scoring over and above the admission cut-off will be called for the further shortlisting rounds. If candidates hold work experience of less than 6 months, no weightage will be awarded for the same in the Final Admission Selection. To get admission to the MBA programme of NMIMS, aspirants should gain a fair idea about the cut-off scores of NMIMS deemed university. The institute release campus specific cut-off for the MBA aspirants. The highest admission cut-off is generally kept by NMIMS School of Business Management, Mumbai campus. This cut-off score is basically for those candidates who appear for the NMAT by GMAC MBA entrance exam. Those candidates who score the percentile mentioned in the Expected cut off column will be called for the further shortlisting rounds by the corresponding campuses. The programme fees for various courses run by NMIMS in their campus at various locations are mentioned as under. The programme fee provided here is as per the fee charged from the MBA 2018-20 batch. However, the institute’s admission committee holds the final rights to change the amount of the fee as per their final decision. MBA: Rs. 17.5/- Lakhs p.a. MBA Pharmaceutical Management: Rs. 10.5/- Lakhs p.a. MBA (HR): Rs. 17.5/- Lakhs p.a. MBA (Family Business): Rs. 18/- Lakhs p.a. PGDM Bangalore/ Hyderabad/ Navi Mumbai/ Indore: Rs. 14.5/- Lakhs p.a.